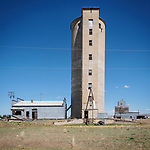 Three grain elevators, Corral, Idaho. Telephone booth, Hill City, Idaho. Abandoned grain elevators, Hollister, Idaho. US 93, Thousands Springs Valley, Idaho.